I use a V-Moda Crossfade LP as my primary headphones when listening to music from my phone. Fantastic sound quality but the wires they include are rather long and as such I do end up in a tangled mess at times. I was recently sent the a-Jays One+ to test out. Promise of tangle-free flat cords? I was pretty excited to try it out. The box they came in was oval-shaped and seemed to be made of sturdy plastic. Definitely gave off a sense of quality and premium feel. Opening it was pretty fun. I tried looking around for a spot to push the inner contents out or maybe clip open the box on the side but this box wasn’t meant to opened that way. There is a note on the bottom that says to ‘remove the sticker to open’. Don’t see that very often! There’s a one button remote having a mic built in which enables the user to either talk or listen to the music on the device. So lets start off with how the One+ fit and feels. They come with five pairs of silicone ranging in increasing sizes. I found the xs and s sizes to be good fits for me. I also tried shuffling the wires around to see if they tangled but no I was wrong! Even stuffing them into a bag and bringing them out repeatedly did not cause issues. A little shake, and they would straighten out. Sound quality on the One+ were great. I tried them with music ranging from soft rock to heavy metal and the sound carries well across them. Calls were also good, loud and clear with no static that is present in a lot of earphones. Personally I am not a huge fan of using in-ear earphones (which is why I main the V-Moda Crossfades) due to my ears getting sore after having them be plugged in for a long time. When you first start using the One+, they are comfortable but I personally would not enjoy using them for hours at an end. I have heard that getting separate softer cones help but I have yet to try that option out. The One+ is also marketed as being Android optimized and you have the option of installing an app for it. The app does a nifty job reminding you of the different button combinations to change songs, volume or take or reject calls. 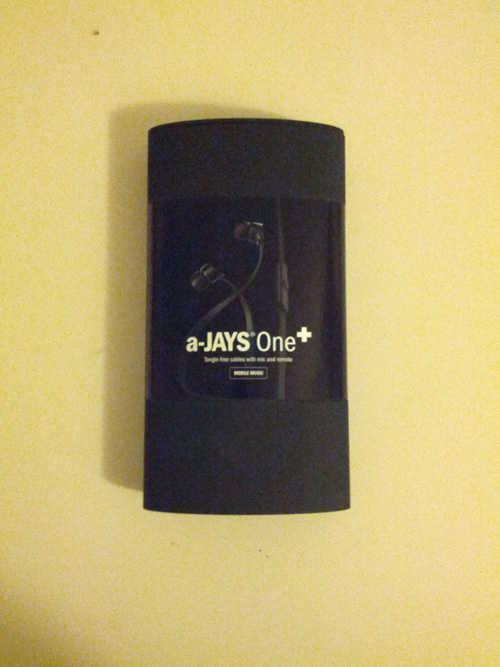 The a-Jays One+ was sent to me by mobilefun.com. They also have a fantastic collection of iPhone 5 accessories that you should check out!. G. Nahiyan Khan is an aspiring product strategist, an user experience designer and a technology enthusiast. If he were to be stuck on a desert island with one request - it would be access to a high speed internet connection. He loves dreaming of new ideas, figuring out the user experiences that go with them and keeping track of developments in the technology world. Visit his site at - nahiyankhan.com.